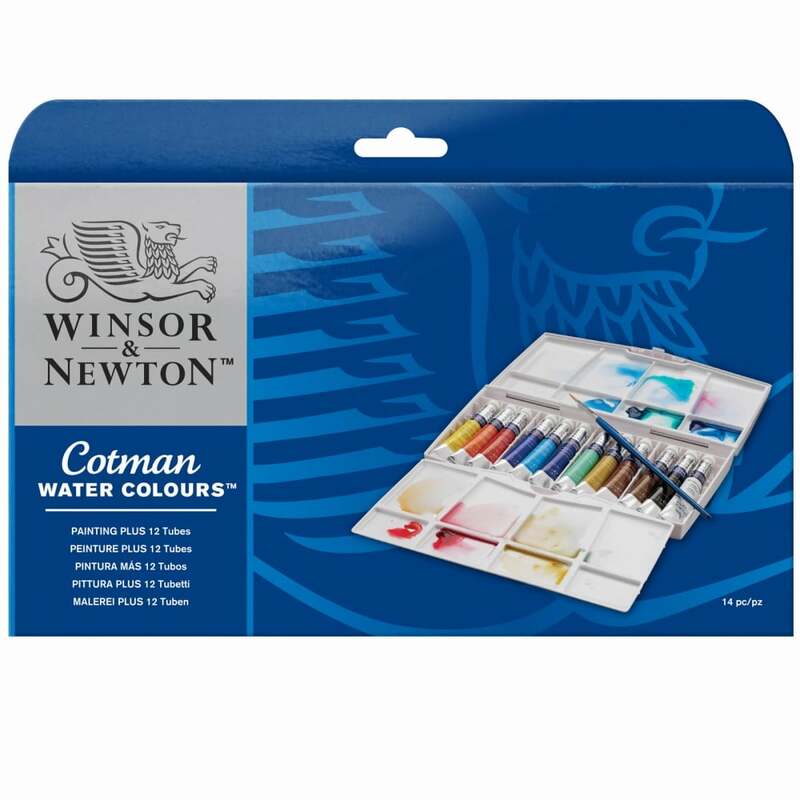 This new quality Winsor & Newton Cotman PLUS set contains 12x8ml tubes of Cotman watercolour and a Cotman brush Series 111 No. 3. This is a great set if you want to travel or just paint outside. Ideal for beginners who want to try watercolours, all the colours will be great for any projects whether its landscape, cityscapes or just illustration. This set includes a removable clip-on palette that can be fixed to either side of the set for extended mixing. There is also a second internal palette which may be used inside or outside the set on a flat surface. The inside of the lid can be used for additional mixing space when other palettes are removed. Showing 3 of our total 7 reviews, with an average rating of 5 stars. Read all 7 reviews for Winsor & Newton Cotman Watercolour Painting Plus Set -12 Tubes. Bought this set it seemed like an great bargain. The tubes are better quality than pans.It can get a bit heavy at first, until you start to get through then. Even though Cotman's are student quality they are very good watercolour paints. They last long and do not fade. Admittedly they do not have as many colour combinations as the Artist quality,but this is easily remedied through careful mixing of colours. 12 tubes ensures that there is enough variety of colours (with mixing) to paint just about anything. Excellent price for so many paints. Good strong case with mixing palette to use when the paints have been removed.